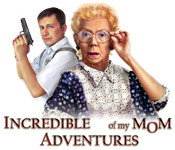 Help Mrs. Burley, and her detective son Sammy, as they dive into the Incredible Adventures of My Mom, a fun Hidden Object game. After the Chief of police is kidnapped, Sammy is put in charge of an extremely dangerous case. Mrs. Burley decides to travel to Italy to help look after her son and ends up in an Incredible Adventure. Travel to beautiful Italy and experience once in a lifetime excitement.